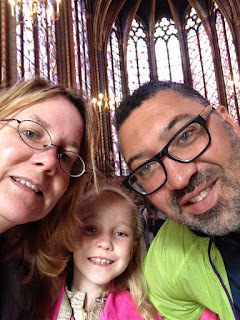 Our Paris trip earlier this summer is quickly fading into memory, and I didn't even write about it all that much. I did not tell you about the joys of walking to the same patisserie each morning for a pan au chocolat and hot, strong coffee, and being recognized by the counter girls. I did not tell you about making a new friend and walking the rainy cobbles of Montmartre. I did not tell you about the sun setting oh-so-late, so you stop at a sidewalk cafe bustling with people long after dark for wine and chocolate mousse and revel in all being up late. I did not tell you about champagne with Rosy in a square with fountains in the middle. I did not tell you about the light on Notre Dame. I did not tell you about the wonder in Patrick and Beatrix's eyes when they first saw Saint Chapelle, and the Orangerie. I did not tell you about the mix of the old and the new with new art installations placed into Versailles. Or the Pont des Arts. I did not tell you about a Seine boat ride in the pouring rain. I did not tell you that the Bridge of Locks had been taken down, so locks spring up all over the city. I did not tell you about the dog in the basket the night of our anniversary dinner. I did not tell you about the dogs all walking perfectly with their people, not needing leashes. I did not tell you about walking narrow streets, peering into courtyards. I did not tell you about the shop filled with butterflies, and shells, and a stuffed yak. I did not tell you about the exhibit at the Pompidou Center that we loved so much we went back to, twice in two days. I did not tell you about Beatrix blowing bubbles off the top of the Eiffel Tower, or sailing a sailboat in the Jardins de Luxembourg. I did not tell you about so much. But it is all in my memory. Hi Bethany! What a wonderful experience your family had. I've never been to France, probably never will, so I live vicariously through others travels. The Frence Cafe's will long linger in your mind, I'm sure. St Paul/ Mpls maybe seems a bit dull right now, but it's home and not much is better than that.